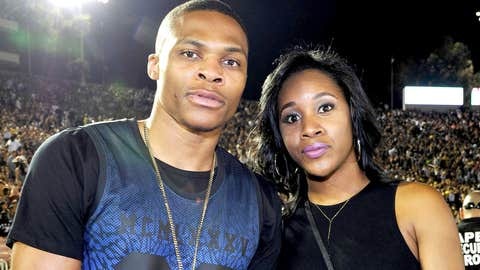 Oklahoma City star point guard Russell Westbrook met Nina Earl when they attended UCLA. They were both on their respective basketball teams in Westwood. A few years later, Westbrook proposed to Earl. And almost one year after that, the couple was married in Beverly Hills, Calif., over the weekend. My life! I love you like XO @russwest44.. Thank you @jasonofbh for the gorgeous ring! The first pictures of the affair have arrived, and Mr. Fashion himself lived up to his reputation. Notable names in attendance included his Thunder teammates Kevin Durant and Serge Ibaka (with girlfriend Keri Hilson) and former teammate James Harden (with girlfriend Khloe Kardashian).